In the fifth chapter of the book of Ephesians, Paul tells about the relationship between Christ and His church. Christ is the head and the church is the body. We are to submit to His authority because of our love for Him. He gave the ultimate sacrifice by dying a cruel death on the cross because of His love for His church. The Alexandria Baptist Church has endured for 175 years because of the love between Christ and His church. A church is not a building. Although we celebrated the 100th year in our church building, it is not the building that makes it a church. It is the people and their love for our Lord and Savior, Jesus Christ. We could worship as our forefathers did in 1827, in a barn or if we should outgrow this building and build a new building. 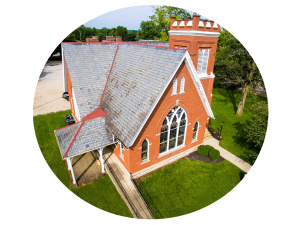 Previously, the history of our church had been compiled during two different eras. The first time the history was written was in 1927, prior to the celebration of the centennial anniversary of the church. The 100th anniversary date (April 24, 1927) was based on the date at which the original church split into separate St. Albans and Granville churches. This portion of our history was written by Walter Castle Sr. The second portion of the history was compiled by Sylvia Reese in late 1974 at the time Pastor Mike Derry became pastor of the church. In the year 2000, John Green combined the two histories and brought the history up to date. Copies of these documents are available to read upon request. These documents were used to write the shortened history reported here. Prior to 1827, the meetings were rotated between Granville and St. Albans. The meetings were usually held at the cabin home of one of the members. It was inconvenient to attend church in Granville, so the members from St. Albans, eleven in all, asked for and received letters of dismission. The plan was to form a separate church in St. Albans. The eleven members were: Levi Nichols, Thomas Spellman, Joseph Barnes, Sanford Castle, Rhode Burnet, Betsy Nichols, Polly Phelps, Maria Barnes, Polly Drake, Mary Atwood, Bethia Castle. A council met April 24, 1827 in Helen Rose’s barn near the brick schoolhouse that stood at Scott’s Corners one mile south of Alexandria. The eleven with three others, David Adams, Elias and Phoebe Willison, who brought letters from the Monroe Church, became the constituent members of the St. Albans Baptist Church. The council was Elder Drake, Elder Sedgwick, Elder Hanover and Elder Wildman, in addition, a number of prominent laymen from Granville, Harlem, Berkshire and Monroe. Immediately after drafting the constitution of the new church, a church meeting was held and four members were received for baptism. The following Sunday morning, four more were received, all of whom were baptized after a sermon by Elder Sedgwick. In the afternoon, another sermon was preached by Elder Drake, after which he gave the right hand of fellowship to the new members. The first pastor of the little church in St. Albans was Elder Daniel Wildman. Elder Wildman was a native of Connecticut. He was one of those versatile people who combined the useful avocations of preacher, veterinary surgeon and horse trader of the David Harum type. For some years the meetings were held alternately at the log schoolhouse that stood near where the residence of Horace Parsons now stands (SR310 & SR 37), and at the brick schoolhouse on the Worthington road, one mile south of Alexandria (SR 37 & SR 161). The schoolhouse soon became too small to accommodate the audience and the church resolved to build a larger house, on or near the town plot of Alexandria. Professor Drury of Granville College had now become pastor. In 1834, he encouraged the congregation to build a larger, more central church. The church was near the present brick building. The seats were made from slabs from the sawmill, holes were bored in the slabs and legs were inserted to support them. The inside of the church was never plastered and had no way of heating. The first meeting house soon needed repairs. In fact, it was such a flimsy building that the church members were afraid to worship in it for fear a sudden gust of wind would overthrow it and crush them. The first attempt to raise money for the repair of the building collected less than one hundred dollars. Asa Gurney and Oren Bryant then took the matter in hand and in two days secured pledges for fourteen hundred dollars for building a new church. It became evident that a new and much better structure could be built, rather than repair the old one. The first building built in 1834 was ordered sold in 1838. The proceeds of the sale paid for the seats in the new building. The first structure was abandoned after a life of four years. It became part of Mr. Buxton’s barn on the farm directly across the street from the present church building. On the 25th of March 1839, a contract for building the new house, (the melancholy ruins behind the present brick church are the remains of the house of which we are now speaking,) was made with Suel Wilson and Silas Burnett, the consideration being six hundred dollars; one hundred dollars down, one hundred when the house was enclosed, two hundred in September and two hundred January first, 1840. They were not able however to complete the building all at once; the basement was plastered and seated and became the home of the church for four years. The church after many attempts, usually resulting in failure, finally completed the building in 1845, where the Association met at Alexandria. The church bell was secured, I presume at that time. There is no record of any formal dedication though people of the time had a distinct recollection of the occurrence, differing only as to who preached the sermon. Enos and Levi Nichols laid the foundation walls of the church building. Asa and John Gurney furnished the black walnut for the siding, shingles and inside work. Freeman Curtis made the sash and doors. Orrin Bryant and John Gurney did the plastering; Augustus Castle and Charles Stewart furnished the timber for the frame. But it is useless to mention names; each one did all he could and everyone did something. Among the many devoted Christians of that age, is to be remembered that patriarch, Grandfather Levi Nichols. His close walk with God and purity of life made very impressive those words of Christ: “the pure in heart shall see God.” When one listened to his low, modest but earnest voice in prayer, one could but think he was in the very presence of God and talking to Him face to face. Those walls of wood and stone have witnessed the march of heroic and historic characters, Wildman, Drake, Darrow, Owens, Pratt, the two Goings, Ezra and his most illustrious brother, Jonathan and many others. The list of those who served in the old building closes I believe with Dr. Spencer. Within those walls Salmon P. Chase, later Chief Justice of the U. S., once lectured. Once a summer school was conducted in the basement by B. F. Harmon, who afterward became a Baptist minister. One of his pupils afterwards became a noted lawyer and judge. Another was an honored and useful professor in a western, college for forty years; and the teacher’s little boy, Judson Harmon, became Attorney General of the U. S. and later Governor of Ohio. A subscription of seventy-five dollars had been secured for purchasing a church bell. With this money in his pocket and a box of lunch in his hand, John Gurney started on foot for Cincinnati to purchase a bell. He soon fell in with a mover’s wagon bound for Iowa and putting his lunch on the wagon John followed on foot. He stayed the first night with Elder Eldredge at Columbus; the second with Elder Gorman at West Jefferson; and staying each successive night with good Baptist families, or at hospitable farm houses. Arriving at Cincinnati, he enjoyed the hospitality of an old pastor, Prof. Drury, during a two weeks’ stay, during which he became posted as to the proper composition of bell metal. A contract was made for a bell, but when it was cast, John’s critical ear detected the dull thud of lead instead of the clear and merry ring of silver. It did not suit Mr. Gurney. It was broken up and again cast into the furnace with a part of it Indian tin, a composition metal containing more silver, and lo! there came out a bell clear and musical in tone just suited to the wants of the little church at Alexandria. John again filled his lunch box, and made his way home in a way similar to that adopted in going to Cincinnati. In due time the bell arrived, hauled on the very same wagon which carried John’s lunch box down. The cost of the bell was $355.00. The weight of the bell complete with its hangings was 1200 pounds. In the early fall of 1897, the church under the leadership of Bunyan Spencer, decided to erect a new building. R. F. Tyler, C. B. Buxton, J. T. Reese and L. C. Laycock were appointed to solicit subscriptions, the terms of which were that the total subscribed by June 1, 1898 must equal $6000.00 or the subscriptions were void. So successful were they however that by June 1st, the sum subscribed equaled $6104.00. Brothers Spencer, Van Ness and Mears, were appointed a committee to secure plans; Foster M. Jones, G. M. Van Ness and L. C. Laycock a building committee. In August 1898, the first ground was broken for the basement. During the fall of 1898 the foundation was laid. The brickwork, begun in April was completed in July 1899. The carpenter work was completed in November 1899, fourteen months after the first ground was broken. By shrewd purchasing of materials, by discounting all bills, and by the use of large amounts of donated labor, the total cost was kept down to $6700.00. At the time of the completion of the building, a debt of $600.00 was reported. By January 1, 1900, the date of the dedication of the building, this debt had been cut down to $130.00. At the time of the dedication, a subscription was taken, which in a few minutes amounted to $250.00. So the church was dedicated free of debt! Farewell services and roll call morning and evening were held on December 31, 1899 at 10:30 A.M. in the old building which stood about 200 feet north of the present brick building. The exercises consisted of early history and biographical sketches, song by Juniors, Roll Call, Sunday evening Organ Voluntary by Miss Myrtle Williams, Hugh and Karl Fisher’s mother and Sermon by Prof. R. S. Colwell of Granville. Miss Cora Williams rendered a selection entitled “A Farewell”, composed by Osner Hooper. The dedication service was held January 1, 1900. The program began with an organ voluntary by Mrs. R. C. Buxton; solo by Mr. F. G. Warden; sermon by Rev. Prof. C. L. Williams; report of building committee by Dr. L. C. Laycock; reception of key, G. M. VanNess, Ch. of Board of Trustees; prayer, pastor Rev. Bunyan Spencer; anthem, choir; Bible presented by O. C. Hooper. April 10, 1901, the church voted in favor of the trustees selling the old building. The Chairman of the trustees, F. M. Jones, reported that the estimated value of the building and land was $450.00 and that they had made an even exchange with Bro. J. T. Reese for the building lot on which the present parsonage now stands. January 12, 1910, to encourage more interest in the annual business meeting, a banquet was planned. The ladies served a nice supper, over one hundred attending. Instead of reports, toasts were given. On Sunday, May 8, 1910, Mothers Day was observed for the first time. November 5, 1910, the church voted to adopt the Budget System to meet current expenses; up to this time a committee had always been appointed to solicit subscriptions. It was recommended that the trustees make arrangements with the Alexandria Bank whereby the pastor could receive his weekly salary each Monday morning. March 3, 1919, was first mention of the church contributing to the Ministers and Missionary Fund. It was voted to pay $60.00 per year for three years. May 8, 1918, the church voted that Trustees act as finance committee. May 19, 1918, the pastor’s salary was raised from $1,000.00 to $1,200.00. Harriet Lawrence reported a very active World Wide Guild. Their “industrial work” was making baby dresses for a hospital in India. In the business meeting on September 15, 1920, action was taken giving the Deacons the responsibility of taking care of the communion articles that were replaced by individual cups in their best judgment. Vacation Bible School was first mentioned in minutes of May 10, 1922. Up to this period, Deacons were elected for life. On March 4, 1928, all deacons resigned. They were reinstated by electing them for a definite term of service of four years, two going off the board each year. July 10, 1929, was the first mention in minutes of pledge cards being used. In 1930 the community celebrated its centennial anniversary. The ministers, Rev. Thomas Smith of the M. E. Church and Rev. Ray McMillan of the Baptist Church, worked with committees. At this time the Maunday Community Communion services were instituted and have continued to be very special community endeavors, with a joint committee planning for the services each year. January 13, 1935, at a morning service the church voted to license Paul Shaub to preach. An auxiliary board was organized about this time that eventually became the Church Council. February 4, 1942, at a special called meeting the church voted unanimously that an associate membership be established, whereby a person who has professed Christ and having been a member of another church and received the ordinance of baptism by another mode than immersion might become a member of this church. An associate member could either join our church by letter or by Christian experience. An associate member would enjoy all the rights and privileges enjoyed by other members except voting on questions of baptism and being a voting member of the American Baptist Convention. Eight members were received at this time. September 7, 1944, the Clerk reported these accomplishments: Board of Christian Education held mid-winter community educational seminar including Bible courses, methods courses and a layman’s forum on the church and the past world war; community vacation Bible school; Chinese soup kitchen supper on behalf of’ World Emergency Fund; Christmas gifts sent to Japan; vacation Bible school offering sent to help southern Ohio Bible schools; churches sponsored community wastepaper and fat salvage program with success; furnished leadership for Youth Canteen. January 18, 1946, plans for Christian Life Crusade are mentioned. The years 1946 – 1947 records show a very busy church. The calendar shows many things happening: The Columbus Baptist Association met in Alexandria; beginning in October a school of religion continuing through February; a Harvest Festival School of Missions was held; a Christmas Cantata; a Corn supper served; Christian Life Institutes held for five successive weeks. February 1, 1948, the church voted to present a Bible to each person upon baptism. February 12, 1949, a special meeting was held to act upon installing rest rooms. On April 29, 1948, the trustees reported 5l ft. well drilled, giving 22.5 ft. of water standing in the pipe at a cost of $262.29. In 1952 the church celebrated its 125th anniversary. Services started Friday evening, June 6. Dr. Edwin T. Dahlberg was the speaker. On June 6, an historical program and fellowship dinner was held. Rev. Ray McMillan, a former pastor, conducted a songfest. Mary Nichols Forsyth, a direct descendent of a founder of the church, played a piano solo, she having been church pianist for forty years at that time and continued to serve in that capacity for fifty years. There was an exhibit of historic objects, including the pewter communion service that was used when the church was organized in 1827, the old pulpit Bible, letters from former pastors and church letters to the Columbus Association. The Pastor, Rev. LeRoy Day’s sermon topic was “Saints of Alexandria.” The planning Committee consisted of Mrs. Foster Tyler, Mrs. Walter Castle, Mrs. Elmous Mowrey and Mrs. Ernest Thomas. April 5, 1953, the church licensed Paul Ashbrook to preach. The church at this time was realizing the need of more rooms for Church School classes. In May 1954, a building fund was established by transferring $500.00 from the current expense budget. Interest from the VanNess Fund was added. A committee was appointed consisting of Larry Lloyd, Arnold Lynd, Lillian Price, Sylvia Reese and Rev. Day to work with the trustees in making plans for an addition to the church building. In the meantime the building fund was growing. By May 1955, Mr. George Price, Chairman of the Board of Trustees, gave plans for the new addition. On May 29, 1955, Rev. Day tendered his resignation, effective September 1, 1955. Work on the building project started during the summer and excavation was completed by August. Due to rain and a shortage of workers, there was a delay in pouring the footer. This caused the sand under the stone and brick wall to give way. It was a shock to find all the primary furniture at the bottom of the excavation, but it proved to be a blessing for with the change of plans that had to be made, rooms were made larger and those on the second floor could have better lighting. At this time Mr. Ellis T. Reese was elected moderator to serve during the time without a pastor. August 21, 1955, at the morning service the moderator, Ellis T. Reese asked for a motion that Rev. Randall Fordham be extended a call to the pastorate of this church. After Rev. Fordham’s arrival, the work on the new addition continued. Fred Kreutz of Columbus was the builder. The annual report of January 4, 1956, tells of much work and planning having been done, type of flooring to be used, the Board of Christian Education meeting with teachers to plan needed equipment, many members ailing hours of labor, such as Ben Moore making all the worship centers for the new rooms, donating marble for the top of one, Mrs. Ila Nichols giving marble for another, Mrs. Ben Moore and Mrs. Lucy Glenn making all the drapes and skirts for worship centers, the Philathea Class furnishing the material, William Frampton and Duward Disbennett making tack boards. Church School classes bought chairs. The Berean Class did a great deal of work in the basement, contributing money earned from Lord’s Acre project and men of the church helped with painting, also the varnishing of the ceiling beams. The project was completed in late 1956. January 1957, a dedication service was held at which time the note representing the debt on the addition was burned by Mr. George Price, Chairman of the Board of Trustees. The addition was built at a cost of $15,000.00 a dedication service was held with Rev. Arthur E. Basile, representing the Ohio Baptist Convention, as speaker. He preached on the theme “Lengthen Your Cords and Strengthen Your Stakes”, Isaiah 54:2. Everyone felt that Rev. Fordham showed a great deal of fortitude and leadership to come into the middle of a building project. As we look back we feel that this project was one of the great efforts of the church, making possible a graded church school, giving our children the opportunity to be in their own age groups. It is hard to believe that for years we had one children’s class including children from age three through eight. Through the news media it was learned in the early part of 1958 that a Cleveland industrialist, Mr. Claud Foster, was giving 500 organs to small churches in the state. Rev. Fordham was authorized by the trustees to get information concerning these gifts. His efforts proved fruitful. We received the Thomas spinet organ in August 1959. A dedication service was held on October 12, 1958, with Dr. Clayton Pepper of Granville the speaker. For eleven years we enjoyed the lovely music from this instrument. The man who serviced many of these organs said ours was one of the last to be discarded, due to the excellent care it had received. People of the church who gave of their time and talent in playing the organ are Mrs. Lillian Price, Miss Sarah Ramsey, Miss Marilyn Terry, Miss Katherine Anderson, Mrs. Martha Mason, Miss Linda Dietzel and Mr. Eugene Brown. The Men’s Brotherhood was instituted early in Rev. Fordham’s pastorate. The women of the church were divided into groups who served dinners for the men. Dr. Paul Judson Morris was the first guest speaker. A number of interesting things happened during Rev. Fordham’s time with the church, such as, first greeters for Sunday morning worship service, the first annual printed reports with all organizations filing reports of the year’s work, Philathea Class furnished guest books for each foyer, Mr. & Mrs. Ben Moore presented the church with the lovely stand for the guest book in the large foyer, we hosted an area workshop on The Lordship of Jesus directed by Dr. Harold Loughead, Dr. Harold Titus lead a service in observance of Baptist Education Sunday, an ordination service for Paul Ashbrook was held, the outdoor bulletin board was purchased, lights in the sanctuary were a gift from Holophane Company of Newark. In 1963 the amplifying system was installed by the Berean Class and pictures for use in all Church. School classes were purchased and presented to the church by the Young Adult Class, now known as the Fellowship Class. Through the years both the Berean and Fellowship Classes have provided our young people church camping experiences and families of the church experiences at Family Life Conference at Green Lake, Wisconsin. A Book of Remembrance, in which it is recorded ministers who have served this church, members who have “passed on”, money memorials which started with the gift of $5,552.00 from the sale of the home of Mr. & Mrs. George VanNess that they willed to the church, people who have presented other memorial gifts, money gifts contributed to the Organ Memorial Fund, was presented to the church in memory of John T. Reese and Laura A. Reese, parents of Ellis T. Reese. The stand for the book was made from walnut taken from the old church built in 1827. The building was owned by Mr. Reese who used the walnut wood for a number of pieces of furniture. In 1964 storm windows were installed on the church windows. So many planes breaking the sound barrier as they went over and causing cracks to appear made us realize our lovely stained glass windows needed protection; 1/4″ glass was put on all windows in the sanctuary at a cost of $1,120.00. In 1964 we find Lillian Price to be the first woman to serve on the Board of Trustees. In 1973, In a report given by Rev. Peaslee his last year with the church, he says, “It is good when there is an openness and freedom in a church which allows us to honestly share and even differ and do it with love.” It seems we are following in our forefathers footsteps for our church concerned itself for others when we remembered the flood victims in Pennsylvania and West Virginia, a teacher in Haiti, the Linview Nursing Home, our children in Vacation Church School sent $41.00 to the Morrow Indian Home in Oklahoma, the Senior High, sent $25.00 to this same home, some laymen showed interest in Judson College, through the Deacons we participated in a church tent at the Hartford Fair, providing films, music, free literature and books. The past few years our Church Picnic has been held on the Anderson Farm on Route 539. On December 31, 1973, we received Rev. Peaslee’s letter of resignation to take effect April 1974. He left us to become manager and director of Judson Hills Camp. The family remained in the parsonage until June, making it possible for the children to complete the school year here. Rev. Peaslee’s pastorate was the longest in the history of the church. Some of the changes in the Church included: the beginning of a post-high school group called the “Pairs and Spares” class; “Singspiration” services were held (a 6 week series of singing and sharing of testimony and fellowship in September and October); and Rev. Derry completed his doctorate work. On April 13, 1980 the church called Rev. J. Alvin Mosher to the pastorate. He began working for the Church on June 22. At the July 13th meeting, the church voted to hold the worship service at 9:30 am year round. The time was previously switched from 9:30 am to 10:00 am in the Fall and Spring. In looking at the annual report from 1980. We see that the Board of Deacons consisted of Ed Hankinson, Bernice Fisher, Sue Terry, Esther Price, Sally Metcalf, John Reese and Verda Reese. Since 1972, women had served on the Board of Deacons, however only one or two women had served at a time. A Board of Deacons for the church with five women and two men was very unusual. The church office of Sunday School Superintendent was created in 1982. The position was created to be a liaison between the Board of Christian Education and teachers, in ordering materials and in updating data on church families. One of the most notable services held this year was a Lift-Off For Life” Fall Rally-Promotion Day. Listed in the 1982 annual report was a Membership Survey. Rev. Mosher and church clerk Beverly Seaton went through the church rolls, updating them as much as possible. The following table was presented. The attendance was on downward trend. Attendance in 1980 averaged about 104, in 1981 it was 92, in 1982 it was down to 79 and by 1983 the average attendance was 75. Rebecca Wells in memory of Roy Wells gave a gift of $5000.00 to the church. The monies were used to carpet the sanctuary, purchased four new tables and a sum went to the Memorial Fund. In March 1983, the Carillon bells were installed in the church belfry. The bells were a gift from Ralph and Thelma Lee Revercomb in memory of Hazel Revercomb. Pastoral Relations Committee was established in January 1984. Given in the 1983 annual report, the purpose of the Pastoral Relations Committee was to “Serve as a liaison between the congregation and the pastor. In January 1985, the tape ministry was established with Lou Shadday as chairman. Tape recordings of the Sunday morning services were to taken to shut-ins. In September 1985, Rev Mosher completed his pastorate with our church. A pulpit committee was selected which included: Shirley Ashbrook (chairman), Scott Hutchinson, Penny Lynd, Gene Brown, Jan Croak and Mose Mowrey. In 1986, Rev. Gene Gillen filled in as interim pastor. A portion of the Wells Legacy money was used to purchase reference materials for Bible study, replace electrical wiring in the church, repair brick/pointing, etc. and purchase hearing aid assistance for the church. On November 30, 1986, a special business meeting was held to call Rev. Gary Doolittle as the new pastor. In 1986, new lighting for the vestibule was given to the church. In June 1988 it was approved that the windows in the classrooms and basement would be replaced with vinyl replacement windows. In July 1988, a Clayton Peaslee Memorial fund for church camp scholarships was established to help children attend camp through our church. The goal of $5000.00 was set. Pastor Doolittle spoke regarding the attendance at the Sunday morning worship Service, average this quarter was 86. This was an increase from the first last year. He described the jail ministry that will be an outreach ministry as soon as participants were qualified. Sunday school attendance was averaging 50. At the October 15, 1989 business meeting, it was reported by John Pylant (chairman of the Deacons) that from September 24 through 27, 1989, a Revival was held. It was considered very successful. Twenty-nine people went forward and 8 were baptized. The Revival was successful through the efforts of the congregation to invite their neighbors and friends. There were 13 professions of faith during the third quarter of 1989. It was also reported that the trustees had completed the storage closet in the church basement and would be installing new doors on the front and back of the church. Patti Pylant started a Junior High BYF. This is also the first mention of Afternoon Adventure Club (AAC). AAC was a ministry held Wednesday after school for Kindergarten through 5th grade. The ministry was started in an attempt to reach un-churched children in our community. In the 1989 annual report it was noted that the Jail Ministry had grown to be a major outreach of the church. It was reported that 210 people were reached for the year (1989) and 7 professed their faith in Jesus Christ. Ed Hankinson, Lowell Rhodeback, John Pylant, and Pastor Doolittle ministered in this outreach. In 1990, the Board of Deacons established a scholarship fund for young people entering Christian colleges. This was the year for computerization of the Alexandria Baptist Church, with Pastor Doolittle becoming quite proficient. He reported at the mid year business meeting that the attendance was edging upward since 1986. For 1986 through 1988, attendance was averaging between 80 and 90. In 1987, attendance was consistently breaking the 100 mark. On Easter Sunday, 152 were in attendance. The Wells Fund still had $15,000.00 at the May business meeting. Mailings had grown to a very high level, so high that the Church was able to get bulk rate (approximately 139 Jail ministry mailings and 66 civilian ministry). A set of fourteen hand bells was given to the Church by Louis and Chip Shadday in April 1991. Gene Brown served as the first leader-director of the bell choir. Gene Brown’s work with the Bell Choir was just one of the many ways he served the Lord through the years in our church. He also served as choir director in the music ministry, as a willing participant on boards, as a children’s worker, as an officer in Baptist Association work and Sunday School teacher, as well as being qualified to preach a Sermon on Sunday morning when the need was there. In July of 1992, it was approved to transfer from the Columbus Association to the Mohican Association. The first discussions of a preschool at the Church had started. Carole Raynes stated that it was feasible to start a preschool and she would teach it. Through the work of Pastor Doolittle and Carol Raynes, the first session of the ABC Learning Adventures preschool was started in September 1993. One full 3-year old class and two full 4-year old classes were enrolled with additional children placed on a waiting list. Six children constituted a full class. This was a non-profit Christian mission for the Church. Following the two years of teaching by Carol Raynes, Michelle Bumgarner has served as Director-Teacher, with a preschool governing board appointed by the Church. In 1993, the church attendance was averaging 108 with the largest average attendance in 20 years. Sunday school attendance was up to about 60. Afternoon Adventure Club averaged 66 in 1994. Outreach programs of the Church now included Adventure Club, Preschool, Vacation Bible School, Jail Ministry and Mission Alexandria. This year noted changes in the way missions were supported, with the Church taking up quarterly mission offerings. Judd & Ethyle Williams, Hope Baptist Church, Dr Stone at Neighborhood Ministries, all received a check for more than the $1000.00. New praise songbooks were purchased through a special offering. Sunday School attendance was growing to the point that there was not enough room. A new Baptistry was donated and installed by Ralph and Velma Brown. It was dedicated in memory of their son Dr. Kenneth Brown. The scholarship fund held by the Board of Deacons was renamed to the Sue Terry Scholarship Fund in her memory as an educator. In January of 1996, a Sunday School room in which Sylvia Reese taught for so many years was dedicated to her memory. Sylvia “Stone” came to our community with the Rev. R. C. McMillan family with whom she lived. She taught school and later married Ellis Reese. For many, many years Mrs. Reese gave much of her time and talents for the Christian education of our church school children. In the summer of 1997, the Trustees took on a project to put a pitched roof over the classroom section of the Church. The cost was approximately $15,000 and a church member gave an interest-free loan. By February of 1998, the loan was completely paid off. On November 2, 1997, Rev. Michael P. McManus preached his first sermon as pastor of our Church. Four major quarterly mission projects were focused on for 1997. Each mission had a goal of $1000.00 and all goals were met. The projects included Licking Co. Coalition for Housing, Neighborhood Ministries, One Great Hour of Sharing and Christian Outreach Missions/Evangelism Judd & Ethyle Williams. In addition, we received a love offering for the ABC Retired Ministers & Missionaries program. The preschool remains almost self-sufficient with an average enrollment of 15 students. Average attendance in the Sunday worship service remained fairly high at 95. Average attendance in 1998 was 106 with the highest attendance of 180. Sunday School averaged 46. Afternoon Adventure Club remains a program to be proud of, with an average of 50 each week. The church membership is listed at 252. The previous computer database on the membership had disappeared. Work to rebuild the database was completed by the Board of Deacons. David Graham taught a 12-week evangelism course entitled “People Sharing Jesus” with twelve attending the course. The Church was involved in starting a local Youth for Christ ministry for Northridge and Johnstown High School students. John Green was involved from the beginning. A feasibility study was performed by the Board of Trustees to add on additional classrooms to the Church. The lack of land to replace the existing septic system prevented the project from being pursued further. In 1999, we celebrated our first 100 years in the current church building. The carpet in the classrooms including the copy room has been replaced. A portion of the “dungeon” or basement has been dug out and a concrete floor poured with walls added to make a finished storage room. The parsonage now has whole house air conditioning. In 2001, new storm windows were put on the outside of the stained glass windows to preserve their beauty for future generations. We have been given this beautiful church and are responsible to maintain it for God’s service. As we celebrate our 175th year of service of our Lord and Savior Jesus Christ as the Alexandria Baptist Church, we find that many of the ministries discussed in this history are going strong. The ABC Learning Adventures Preschool, Afternoon Adventure Club, Junior and Senior High BYF, Vacation Bible School, a wonderful music ministry under the leadership of Sue Davis, Jo Budd and Debbie Brown. We currently have four quarterly missions which are determined by the Board of Christian Education. Our church and our community are changing as the world economy and employment changes; and this can be a positive arena for God’s work to flourish. This is accomplished through the lives of Christian workers who are humbly using their lives and their talents in the outreach for Christ. This is our focus – our mission in the world. The following Section was added to the history as part of a pastor search in 2012. In August of 2002, Pastor Mickey McManus resigned as Pastor. His time as our pastor ended on November 13th, 2002. Pastor Mickey’s strengths included his love for the lost and his love for the youth. Mickey enjoyed watching sports and he usually had a following at Johnstown and Northridge High School basketball games. He had a way of relating to teens. After a Johnstown High School basketball tournament game, my wife Terry and I were waiting for our son Jarod to dress and meet us. When he came out we started looking for Pastor Mickey. There he was in the middle of a group of teens. They had gathered around him and were fellowshipping as if he were one of them. At a Quarterly Business meeting in 2002, a vote was held to create a part-time paid Church Secretary position. Patti Pylant was hired as the first secretary. The function of the Secretary was to prepare the bulletin and the monthly newsletter. Ron Larson was called as interim pastor. As it turned out his time as our interim was short because in July of 2003, Pastor Larry Stewart was called as our pastor. In Pastor Larry’s first few months, our membership roles grew by 17 new members but we lost five members by death. In May 2004, the puppet ministry began. The “Hands of Faith” as they were called began to perform for our church and other churches. The Middlers Youth Fellowship was started in 2004 for children in the 9 to 12 age range. In 2005, we formed a committee to create the Volunteer Policy. The policy states that anyone wanting to serve in the Church or be responsible for our children, must fill out an application and undergo a background search. At this time we also adopted our Statement of Faith. We confess that our Lord, Savior Jesus is the Christ, the Son of the Living God. We believe in the Bible as the divinely inspired record of God’s actions in history, and we believe it is trustworthy and authoritative. We believe that we are all in need of a Savior because we have sinned and fall short of the word of God. We believe that Jesus died upon a cross to save us from our sins and was resurrected on the third day. We baptize believers by immersion as a symbol of death to the old life and resurrection to the new life. We celebrate the Lord’s Supper in memory of the sufferings of Christ. We believe that all Christians, laity and clergy empowered by the Holy Spirit, are called together to be a family of disciples witnessing at home and throughout the world. We believe in the sanctity of Biblical marriage between one man and one woman. After numerous years of holding a joint Labor Day worship service with the Alexandria Methodist Church and the Emmanuel Praise Church, July 2005 was the first time we moved the joint service to the Sunday following Alexandria Fun Days. Following the 2005/2006 school year, Michelle Bumgarner retired from the ABC Learning Adventures Preschool, she had been the teacher/administrator for 13 years. Jackie Roudebush took over as teacher/administrator. The Church website, www.alexandriabaptistchurch.net, was started in 2005. The church newsletter and calendars, as well as preschool information are published on the website. In 2007, the sanctuary was air conditioned. One of the key driving forces for this addition was the hot evenings in Vacation Bible School. The old brick walls of the church would absorb the heat and hold the heat all evening long. Many of the VBS closings were held in a sanctuary that was more than 100 degrees. In 2008, it became necessary to hire a company to repair the beautiful stained glass windows in our church. At a cost of almost $20,000, Franklin Art Glass came in to repair the structures supporting the windows. The money required for this repair was obtained through special giving. July 13, 2008 was date of the first meeting of the K4C youth group (Kids for Christ) ages 5 to 8. We now have Senior High BYF, Junior High BYF, Middlers and K4C meeting at the Church. During 2010 and 2011 Varment Guard worked to remove the bats from the church attic. At this time we believe that they successfully removed the bats. As part of the bat removal process, Varment Guard removed the bat guano out of the attic and replaced it with insulation. 2010 was the last year for the Joint Worship Service called Fun Day Sunday. After 6 years, the three churches involved decided that it was not successful. The hope was that attendance from the churches would be supplemented by attendance from the town. In reality the number in attendance from each church was less than a typical Sunday. For the Alexandria Baptist Church, the average annual attendance was slightly more than 100 but at Fun Day Sunday only 60 were in attendance from our church. In 2011 by a vote at a quarterly business meeting, the position of Church Treasurer became a paid position. Terry Green had served as Church Treasurer since January of 1997. The amount of time required was recognized and appreciated. In November 2011, the carpet throughout the entire church was replaced. Once again monies from special giving were used to pay for the carpet. In July of 2012, Pastor Larry Stewart announced that he would be retiring as a full time pastor. He felt called to spend his retirement serving God as an Interim pastor available to other churches. The years between 2002 and 2012 were marked with a commitment to Vacation Bible School, a strong music ministry which included Easter and Christmas cantatas, monthly fellowship dinners and a growing preschool. Pastor Larry was an excellent singer and sang numerous solos. Special music was the norm almost every week during the worship service. Pastor Larry, Sue Davis and Kaye Maynard performed quite often as a trio. It was a time when we returned to the church for the Men’s Breakfast. Julie and Brenda Reese Harper began to fix breakfast for the men and by 2012 for anyone that wanted a great breakfast. We began to average more than 100 children coming all 5 days of Vacation Bible School with between 40 and 60 volunteers helping. The church demographics changed during this time. The largest group attending church were married couples between 30 and 45 years of age with children. People came to hear Pastor Larry’s excellent Bible-based sermons. Some of our ministries like the Licking County Jail Ministry have been going for more than 20 years. Ed Hankinson and Lowell Rhodeback continue to visit and share the Gospel with inmates at the Licking County Jail. Each year the preschool attendance continues to grow. Average attendance for our worship services has been about 100 for the last 10 years. At this time we are a blessed church with numerous thriving ministries.